On Tuesday, a wheel came off. On Thursday, it was a fire. The trouble this week on the Fitchburg and Kingston lines forced hundreds of passengers to transfer to other vehicles to complete their trips and caused hours of residual delays. Nobody was hurt in either incident, but they’re just the latest examples of lagging MBTA service — despite an ambitious spending plan by Governor Charlie Baker to improve the system. “Riders deserve improved reliability, and the MBTA will continue to make short- and long-term improvements to core infrastructure, vehicles, and in the communication of timely and important information to customers,” Pollack said in a statement. Pollack did not name Keolis Commuter Services, the private company that operates the rail system for the T, in her statement. While the MBTA pays for major infrastructure projects on the rail network, Keolis is responsible for day-to-day maintenance of the system, and pays financial penalties for rider delays. In the past, Pollack and Baker have criticized Keolis for service issues, especially during winter storms. But Jacquelyn Goddard, a spokeswoman for the transportation department, said Pollack was not blaming Keolis, or anybody else, for the problems prior to an investigation. Goddard said other outside contractors are sometimes responsible for repairing vehicles, and their role would also be assessed as part of the investigations. Thursday’s engine fire in Hanson occurred at about 6:55 a.m. on a train with about 175 passengers who were eventually transferred to another train. The incident caused long delays for some trips on the Kingston/Plymouth line throughout the morning commute. Keolis Commuter Services spokesman Tory Mazzola said the fire would be investigated, but that it was related a problem with a turbocharger. Mazzola said the locomotives are inspected daily, and that the one that malfunctioned in Hanson was also inspected before it went into service Thursday. While several commuter rail locomotives are due for major overhauls in the next year that will extend their life by about 20 years, the locomotive involved in the fire is not scheduled for such work. The T said it would likely be placed in a future overhaul program. It joined the fleet in the late 1980s and was refurbished in 2002. 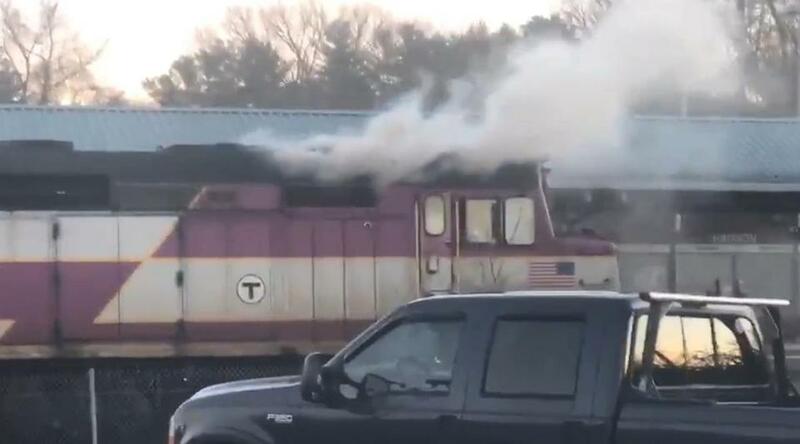 MBTA spokesman Michael Verseckes said the turbocharger was the only component of the engine that was damaged Thursday, and it can be replaced within a matter of days. The derailment Tuesday happened when a wheel came off a Fitchburg Line train, packed with about 800 riders at about 7:45 a.m. as it neared Belmont. Service was not fully restored on the line until about 3 p.m. Tuesday. Officials promised to boost inspections following the derailment. The Baker administration’s plans for the T include commuter rail fixes, such as the locomotive overhauls and repairs to tracks and bridges. The state is also studying loftier ideas to improve the system — whether to run more frequent service, electrify the network, and buy new vehicles. That review will be completed in 2019, as the T prepares to issue a new contract for a commuter rail operator in 2022. In the meantime, the commuter rail has boasted some improvement, with notably better on-time rates on the Worcester and Haverhill lines in recent months. But today’s riders still regularly face delays and crowding, plus more serious blunders like the derailment and fire this week. It’s a similar story on the subway system, where officials have promised increased frequency and better reliability on the Red and Orange lines. Yet those fixes are still years away, and in the meantime riders still face regularly maddening delays and overcrowding. Earlier this week, at an event hosted by CommonWealth magazine, MBTA chairman Joseph Aiello said fixes will take time, and the T is “still at the very beginning” of its quest for improvement. Travis Andersen of the Globe staff contributed to this report.